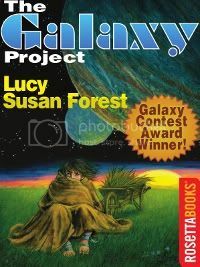 Co-Winner (with Robert Walton’s VIENNA STATION) of the first Galaxy Project Long Story Contest, Forest’s novelette is (as Judge Robert Silverberg writes) a rigorously worked novelette in the grand tradition “which would have delighted Galaxy’s great editor Horace Gold”. Humanity has dispersed throughout the cosmos in post-apocalyptic space flight; the colony on the planet Faela has terraformed the planet unsuccessfully, an indigenous biological virus has over the generations shrunk the numbers of the settlers and threatens their further existence. How the protagonist scientist, comes to terms with this seemingly ordained doom, and what this struggle implies for the continued, wider perpetuation of humanity are at the center of this carefully paced and brilliantly logical extrapolation. “Lucy” is available on Amazon. Susan Forest’s “Lucy” is classic science fiction in the problem-solving mode. She creates a realistic alien environment that possesses great difficulties for the humans that have come there, sets her characters in opposition to those difficulties and works out the solution to the challenge with admiral narrative logic. I think that very demanding editor Horace Gold of the old GALAXY magazine would have responded to this story and its author with great excitement. Wow!! I Loved this story and I would enjoy seeing this story made into a novel, or even a series of novels like Allen Steele’s “Coyote” series. This story has just about everything I love in SF; a far off planet (moon in this case), with an alien biochemistry hazardous to humans (forcing people to overcome and/or adapt), adventure, a little romance, and even a little politics. If I were an Anthologist I would put this story in my Best of…. I’m very interested in what happens to Tian and Jerry and their small community in the future, but also the back story, what went on before “Lucy” to create the conditions that take place in the story. Also, Great Title, very appropriate. Susan, please write more, I will be looking for your work in the future!! !